Yay! They're done. I had to redo the right hand one three times due to miscalculations on my part. I guess that that's what happens when one doesn't follow a pattern and is just kind of making it up as they go. But I think it has come out much better than it would have otherwise. I had two ladies with mildly smaller hands than mine try them on, and they seem to fit just fine. So I'll be sending them off in the mail today. As you can see, the yarn didn't have the bright yellows that were in the picture... or that I had thought were in the picture of the yarn itself, but the gold browns are very nice, especially close up where they're flecked with other colors. The overall effect seems warmer... and should go well, I hope. And the yarn was, indeed, a joy to work with, and I got paid plenty to buy a bit more for me. Thank you, Gretchen!! The shawl inches along, I'm on the second needle size, but the beading goes along slowly. *laughs* I knew that with the PI shawl it would, as each section takes just as long as all the previous ones put together. I have a small hat commission, and the plate will be ready to pick up on Wednesday, so that'll be done, too. This morning is the first morning of a week where Jet's going to be at Camp Invention, so I'll have most of the day to do things with. I have *edits*!! Hee. Thank you! Lovely gloves, yes! Have fun with the vacation from momming? *giggles* Nice when my Mom duties are kind of fun. Those are so beautiful. I love the colors!!!! These are much faster than sweaters. *grins* These and socks and hats I get addicted to when I have a bigger project in the works. 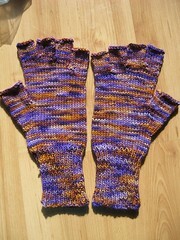 Oooooh, fingerless gloves!! They look wonderful. Have fun while on your own! Oh those gloves are awesome. What gorgeous colors. *cries* I'm still so upset they canceled camp invention in our area. Cosmo loved that camp. I hope Jet has an awesome time. Thank you! These cost a bit more than the thicker ones, as all the fingers do take a lot more time. *laughs* But... think about what kind you'd like... and if you like these colors I do have more of this yarn left, too. I hope Jet enjoys himself. He wasn't so sure about a camp that would be as long as his school days; but he really liked the concept of the camp! I hope the Mad Science camp goes well!! Also, I totally remember Camp Invention! XD I used to love it! ZOMG those look so awesome! I love how the colors came out; it looks so organic! Squee they arrived! This yarn is even better than it looks in photos, and it looks so good! It has this wonderful weight where they are light yet still toasty warm. And so pretty and beautifully made! Eee thank you! YAY! Hee... I love that Brad could tell.